If you've mastered the basics of the Microsoft Office suite, one of the next things to try is using the programs together. For example, if you're preparing a report in Microsoft Word, it's easy to insert an Excel spreadsheet. There are two basic ways to do this. If you just need to get the information into your report to display as a table, simply open your Word document and put the cursor at the desired location for the table. Then, open the Excel document, highlight the area of the spreadsheet you want to copy, right click to "copy", and then "paste" into your Word document. This will create a table of the information in your word document. Note that when you "paste" the selection into Word, if you right click to enable the paste, instead of just using CTRL V, you'll have the option of selecting the style of selection to match the original, or match the Word docment style. If you want to continue to "do math" in your Word Document (in this example, perhaps updating the sales figure and re-calculating the average), you can actually insert the spreadsheet as an Excel object. 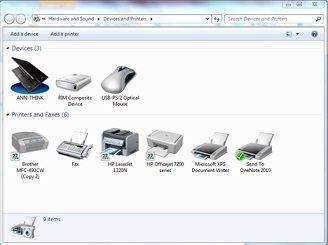 In your word document, select the "Insert" tab and select "Object". 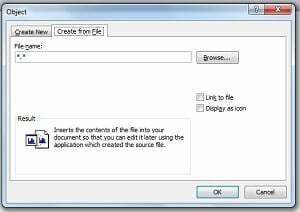 From there, a new window will appear, and you'll select the "Create from File" tab which will let you select the file you have already created in Excel. 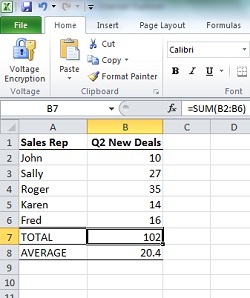 Since the Excel spreadsheet is inserted as an object, you can actually go in a change the sales figures and total and average will automatically be recalculated. 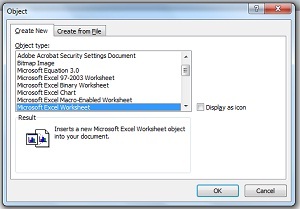 An alternate approach is to create a brand new Excel spreadsheet directly into Word by selecting the "Create New" tab and selecting "Microsoft Excel Worksheet" as the "Object Type". This is convenient way to add more information to your reports or presentation documents, and strengthen your communicatios. We strongly advise clients to keep looking for more ways to get value from the technology they already have. Keep your electronics COOL in the HOT Summer weather! You may want to think twice before you leave your valuable electronics in your car on a hot day. If you take your portable devices in the car with you, keep in mind that your car will get MUCH hotter than the outside temperature when you park it on a hot sunny day. iPhones and iPADs have operating temperature ranges of 32-95 degrees F, and a safe storage range of only up to 113 degrees F. Blackberry's and hard drives generally have operating ranges up to 122 degrees F, and digital camera specs typically call for storage below 120 degrees F.
On a hot day (80 degrees F), your inside car temperature can go up to 123 - 140 degrees F ! Your dashboard and seats can rise up to around 180 degrees to 200 degrees F. Your car will heat up rapidly in the sun as this online illustration shows, so it's not a good idea to leave your electronics in the car for extended times. I found an interesting experiment on-line where the author measured temperature inside coolers (without the ice, as ice would lead to damaging condensation and humidity!) so that may be a way to store expensive and sensitive equipment if you really need to. Check the safe storage temperatures for your equipment, and let your electronics cool down before operating them. Of course, keep electronics out of site to deter theft.